The reason I was in Moorhead was to do a story about Joe Acree. Joe has been taking the daily rainfall readings there for nearly 47 years. Joe had just received the Thomas Jefferson Award for his dedicated service. The gist of the story: when you are faithful to your duty, sooner or later somebody will notice. As I was leaving town I crossed the little rise on Washington Street where the railroad used to run. Nearby is where the Southern crossed the Yellow Dog – Yellow Dog being the Yazoo Delta railroad. It was nicknamed Yellow Dog because the rolling stock was painted yellow with the initials “Y.D.” on the sides. 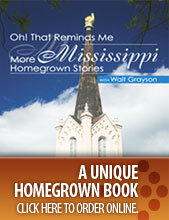 The Yazoo Delta was the north-south line and the Southern was the east-west line and they intersected at Moorhead. And by intersected I mean like where two streets cross at a 90 degree angle. And that intersection became famous in blues songs. Perhaps the most famous is the “Yellow Dog Rag” by the Father of the Blues, W.C. Handy. The same song goes by the later name “Yellow Dog Blues.” You can hear several versions on YouTube, including one recorded early in the 20th century by Handy himself. Handy first heard that song being squeezed out of an old guitar by a black man using a broken knife blade as a slide while he was waiting at the depot in Tutwiler around 1903. The man was singing that he was “goin” where the Southern Crossed the Yellow Dog.” This was supposed to have been Handy’s introduction to blues music. 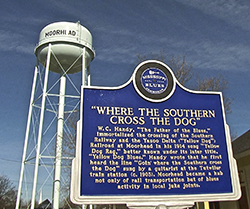 The Blues Trail marker beside the depot in Moorhead is about 100 yards north of where the restored intersection of the “Southern” and the “Dog” resides today, on the same rise I crossed on Washington where the railroad used to run. As I was getting my photo of the marker and the water tower, Moorhead Mayor George Holland walked over from a restoration project he was working on just across the street and introduced himself and asked me if I’d like a tour of the restored depot/museum. There is ample wall space given to W.C. Handy in the depot as well as hometown boys, country music star Johnny Russell and Gov. Phil Bryant. There is history about the town and the area and how agriculture defined the Delta and how changes in agriculture dictated changes in the Delta. With fewer workers needed in the age of mechanization to make a crop, people either left or stayed to compete for the few available jobs. I asked Mayor Holland if Moorhead being on the Blues Trail was helping in any way. He said it brought people there from all over the world to see the railroad intersection landmark, mostly tourists from other states and other countries. “We grew up with the blues. We’re used to it,” explained the mayor. Does the Blues Trail help the economy? “It brings a lot of attention to Moorhead, and you may be able to sell someone a T-shirt who tours the museum.” In other words it brings lots of lookers but few buyers. But there isn’t a lot to buy, anyway. The Blues Trail aptly marks where America’s music was born here in Mississippi. But maybe we haven’t come up with the best way to capitalize on it. Maybe the trail hasn’t hit its stride yet. Maybe we’ll have to be like Joe Acree and continue to do what we do and not give up and sooner or later someone will notice.